A new 24-hour television channel dedicated to the growing trend of cruise holidays has gone live on satellite. 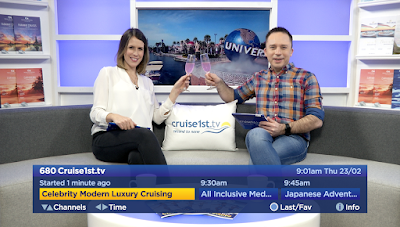 Cruise1st.tv on Sky channel 680 features the latest holiday deals and consumer cruise news. In addition, the channel features in-depth destination guides visiting the ports and cities that are popular destinations for cruise ships. Cruise1st is an independent travel agent specialising in cruise holiday deals with all the world’s leading cruise lines including Royal Caribbean, Celebrity Cruises, P&O Cruises, MSC Cruises and Norwegian Cruise Line. Based out of Manchester, the company has expanded to open operations in Australia and Singapore following the latest trends in the cruise industry. Cruise1st TV started off as a strand of programming on third party channels. In addition to broadcasting free-to-air on Sky, the channel is available online at www.cruise1st.tv & YouTube Live.